The smoker is the beekeeper’s best friend, and it is essential to know how to use it effectively. It is the most important accessory for minimizing stings, even more important than protective clothing. Directed smoke disrupts the bees’ usual defense response when their nest is invaded and creates an atmosphere of harmony with you and your bees. If you were wondering how to use the bee smoker properly, you came to the right place. How to use a smoker? Operating the smoker is quite simple, and there are only several steps to get it started. 1# Open the top of the smoker. 2# Start a small fire in the cylinder. You can use pine needles, pinecones, and wood chips. Pine is a great smoke fuel because of high sap content which makes a wet smoky fire. As a fire starter you can use cotton, dryer lint, or pieces of paper; puff several times to encourage a brisk flame. Remember that air is forced into the fire chamber from below, then it continues through the ignited fuel and exists from the spout at top. This detail is important because it shows that the flame should be below the fuel, not above. 3# Once the fire is started, put more fuel on top and after it ignites close the lid. Closing the lid restricts the airflow and causes the fire to smolder which creates a lot of smoke. As you work on the hive, you should puff once or twice every 5 minutes or so to let the bees know the fire danger is still present. Also, keep an eye on the fuel, you wouldn’t want to run out of fuel in the middle of hive inspection. While working with the smoker, you should be careful where you place it because the outside can get very hot. Before storing it make sure the fire is completely out and the metal had time to cool. Before you open the hive puff smoke several times at the entrance. The smoke will trigger the bees to send the signal that there is a fire danger. You wouldn’t want to mask these signals, so give the bees some time to focus. Now it should be safe to slowly open the lid, just puff once under the lid while holding the smoker 8-10 inches away. Once you open the lid completely and the bees seem calm, you can continue your work. If bees get agitated puff smoke a few times over each box top you are working on. The bees might bump into you but it can easily be solved by puffing smoke a few times around yourself. Doing that lets the bees know that you are the source of smoke so they should stay away. The smoker can be a great help while working with bees so be sure you know how to use it properly. If you know how to use the smoker efficiently, stings can be a thing of the past. 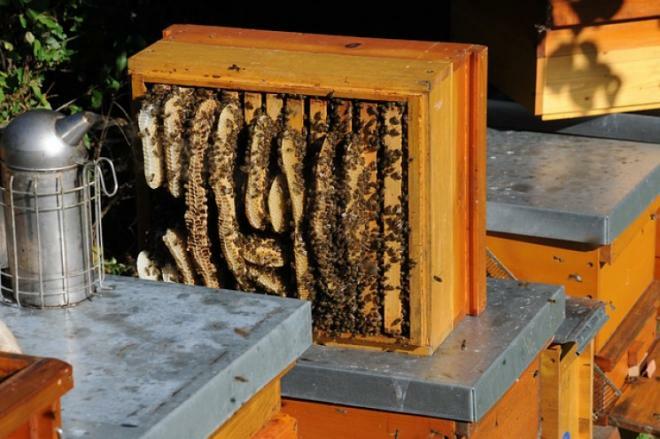 Read more: Bee smoker - why is it an essential tool for beekeepers?